"There’s more to an artwork than its finished state." Could you talk about your background and how BEASTON Projects/Collateral Drawing started? Having graduated from Royal Academy Schools in 2000, as a painter I have continued to make artwork from my London studio and exhibit in many solo and group shows in the UK, Europe, India and New York. The curating came a little later, when I opened a project space in South-East London and jointly ran a residency and exhibition programme until 2015. BEASTON Projects is an independently run initiative that curates exhibitions and off-site projects designed to question the nature of both individual and collaborative art production and curating; showcasing the work of emerging talent and providing established artists with an experimental platform and forum for artistic debate. I often work with other curators such as the recent Foreign Affairs project in Athens, in which five international artist-led art initiatives collaborated to present a cross-cultural project exploring the relationship between the artist as curator and as artist, across cultural boarders. With a father who is a painter and a mother who is an oil painting restorer, I was born into an artistic family. For as long as I can remember, process and interest for materials have played a key roll in my own artistic practice, often embracing the mishap or glitch, as a positive within the creation of an artwork. I often respond to the by-products created as a result of making, and which are invariably the catalyst for new work. The Collateral Drawing series is a reoccurring project that explores the relationship between the surfaces of the artist’s studio and the artworks they produce within these surfaces. It developed out of observations of my own practice as a painter compared to that of my contemporaries from their studio spaces. The realisation through this ongoing and shared experience, balanced with the dissonances between each other’s practices became a growing passion and an apparent need to then develop the concept into an exhibition in 2014. Gary Hume: Artist's stool, collection of waxed cups containing high gloss household paint, paper stencils, old tin of discarded high gloss paint, used painting spatulas set in plaster. Collateral Drawing 5 is your latest project, with some established/well known names. Could you talk about this project and the idea behind it? The Collateral Drawing Series was launched at Plymouth College of Art in February 2014. Since then it has had further editions in Athens, Berlin, East Anglia, and now, Kent. So far the series has exhibited over 40 artists. 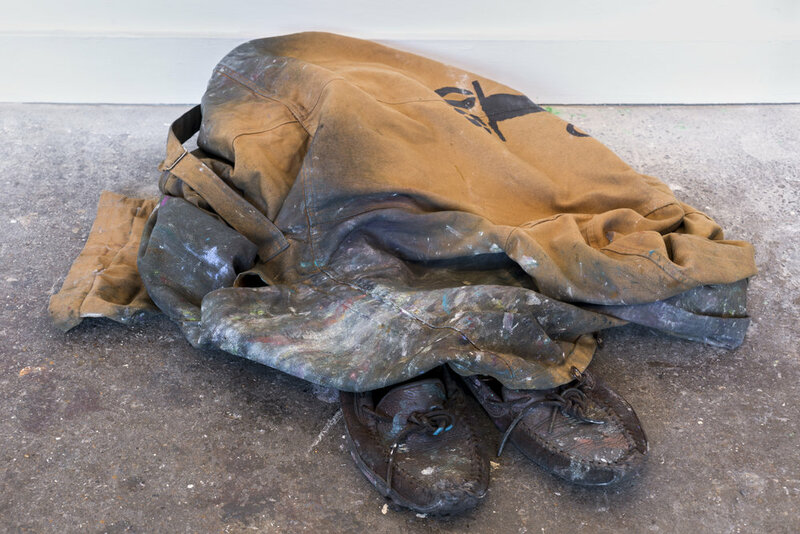 Collateral Drawing 5 explores the relationship between finished artworks and the accumulative elements that feed into, or result from, their making; in an Arts Council funded exhibition and publication with sixteen artists including: Gary Hume, Rose Wylie, Tim Noble and Billy Childish. Emerging talent is interwoven around established artists purposely to enable a freedom for a visual context and to support our next generation of artists. There’s more to an artwork than its finished state. Exhibitions concentrate on this finished product, perhaps along with preparatory studies that act as preliminary versions of that state. Yet there may be any number of by-products from the making of an artwork, and this is what Collateral Drawing explores by showing the ‘collateral’ alongside the finished work. This fifth iteration currently being shown at Strange Cargo in Folkestone features artists who have a connection with Kent. The collateral may take such forms as the stage setting, models or constructions which are created in order to facilitate the work itself; the redefinition of past work as collateral to a future work in which it is re-purposed; various means of recycling aspects of a practice; or the marks which result serendipitously, but with a more than accidental logic, from the production itself. It involves studio visits to meet the artist and gain a better understanding about how they work. This is then documented on the ‘Artists Collateral’ section of collateraldrawing.org homepage. The by-products and artwork are selected at this stage also. 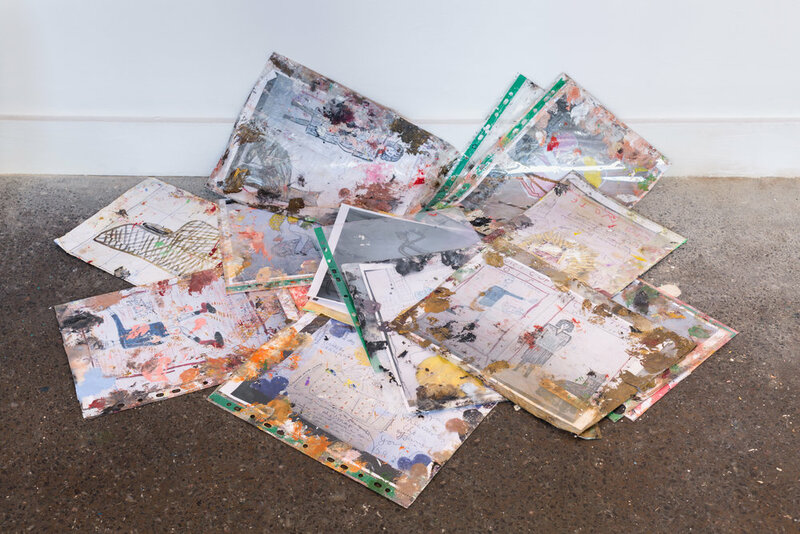 For example, Gary Hume shows a selection of waxed lined cups holding a range of coloured household paint, his paint splattered studio stool, palette knives previously used to stir in thickening paint and now exist set in plaster blocks, discarded coloured paper shapes used for testing new or replacement passages and a old household paint can layered with drips of numerous colours running down the exterior and a body of old paint skins on the inside. All this surrounds a painting on paper from his recent sequence of fifteen monochromatic colour variations of an interesting shape of a loose hand that first appeared in an earlier work called Tired Child, 2015. Bird in Hand (Red) 2016. Scarlett Carlos Clark: Contact sheet from she series, telephone prop from shoot and receipt from refrigerator hire. Tim Noble: Bowl of rusty water, discarded steel wire, rusty pliers and rust marked paper. Do you feel that the idea of Collateral Drawing is to unmask the artist and their work, to see "behind the curtain"? Yes and no. Every artist has their own unique working method that habitually causes repetitive marks to be inflicted onto or alter their working surroundings. Whether dripped, scratched, taped, erased, smeared, hammered or edited: all are repetitive and typically unguarded instances of the process of drawing through any medium. The results hold a fascination of their own: not just as a documentation of the artist’s creative process and an indicator of the thinking which led to the finished work, but as an insight into the relationship between what is subconscious and conscious in the artist’s practice. 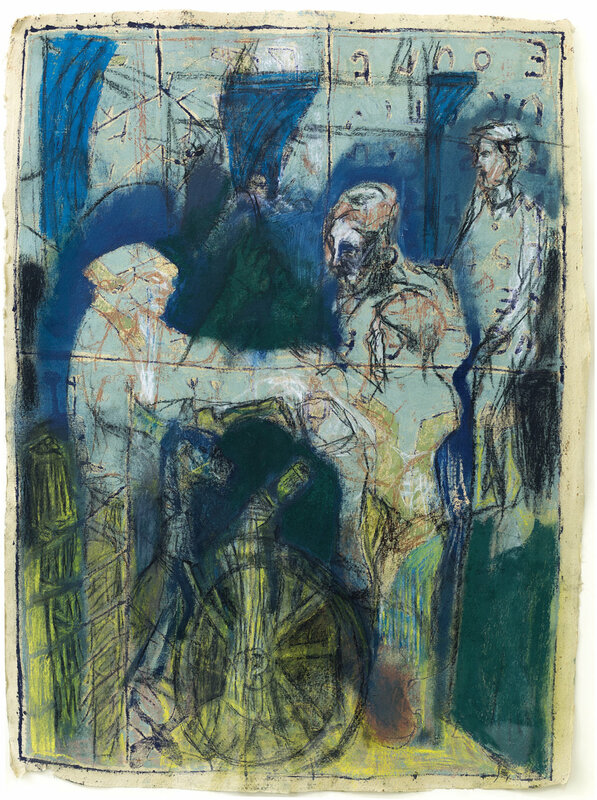 I see the by-products produced by the artist’s as their idiosyncratic habit, and similar to a hand signature or unique fingerprint. The intention is not to ‘reveal all’ but to ‘explore’. And to perhaps present visually what is too often attempted in text. I feel the contemporary artist’s creativity is far more exposed as a result of the instant communication through technology that inhabits our lives, thus impossible to escape, and perhaps as a result there is greater ease and acceptance to therefore reveal aspects of ones trade secrets more freely. This feels far removed from our predecessors such as Frances Bacon, who restricted what he wanted to reveal about his process, thus claiming his paintings were performed directly on the canvas rather than being reliant on a literal process of using preliminary sketches and other secondary material. Instead he described using his reference as merely ’triggers for ideas’. Of course we all learnt after his death, his friend Barry Joules revealed a large collection of reference material that Bacon had given to him, thus contradicting Bacon’s own myth making, but more importantly this gave the public a true insight into how the artist saw the world. When I visited Rose Wylie at her home and studio in Kent, I was excited to experience her world of logic. She referred to the oil paint covered secondary glazing on the studio window as her stained glass. This is where she wipes the excess from the plastic sheets that protect her reference material, whilst handing them with oil paint covered hands in making her large-scale paintings. These are then discarded onto the growing pile below the window, along with her oil paint covered protective latex gloves. The floorboards are covered with newspaper in order to protect them. She described how she knows when she is in a positive place making her paintings, because the newspaper becomes energetically scrambled up, exposing the floorboards beneath. Over time the old used newspaper, discarded tins of paint, brushes and general studio detritus are cleared into a huge heap on the other side of the room to make way for a new work to begin. All these items can be seen on display alongside Rose’s watercolour and collage on paper, Nicole Kidman (Pink Frock) 2015, in the current Collateral Drawing 5 in Folkestone, which continues until 5 November. It is my ongoing interest to continue to explore new ways to provide an invaluable and unique insight into each artist’s working methodology revealing various clues integral to the creation of a final artwork in an intelligent and thoughtful way to engage the public. Rose Wylie, collateral. A selection of photographs of older drawings and paintings kept in polythene folders by the artist and used as reference in making new work. Edgeworth: Painter's tray, painting rag, rubber glove and paint covered plastic lid. What has been your biggest obstacle and greatest achievement in running/curating BEASTON Projects/Collateral Drawing? Not having deep pockets and the need to see high quality curatorial projects through on a minimal budget, dedication and loads of hard work, has its challenges. Gaining recent Art Council funding has been a very important achievement for the Collateral Drawing series to develop and move forward. Having a solid budget has allowed it to turn a massive corner and take on a new direction. A fabulous 80 page colour publication supports the current CD5 and contains commissioned essay and gallery inserts written by Paul Carey-Kent. Funding has also enabled the development of the Collateral Drawing Archive. 49 Artists that have shown in the project so far have donated a by-product that provides an invaluable and unique insight into their working mythology. For the first time this will be shown in a sequence of three shows all programmed around the Collateral Drawing 5 exhibition and publication. The public will have the unique opportunity to see items on display from artists including Ryan Gander, Glenn Brown, Gillian Carnegie, Mark Titchner, Rose Wylie, Tim Noble, Gary Hume, and many more… Check out details below. An ongoing challenge to the Collateral Drawing concept is finding honest ways to present each artist’s by-products that are intuitive and responsive to the way they were originally seen within the working environment. It is important that they aren’t presented as being contrived. Also to introduce news ways to explore the concept by diversifying creative media as the project grows, such as musician Matthew Herbert who takes sound from everyday items to create electronic music. 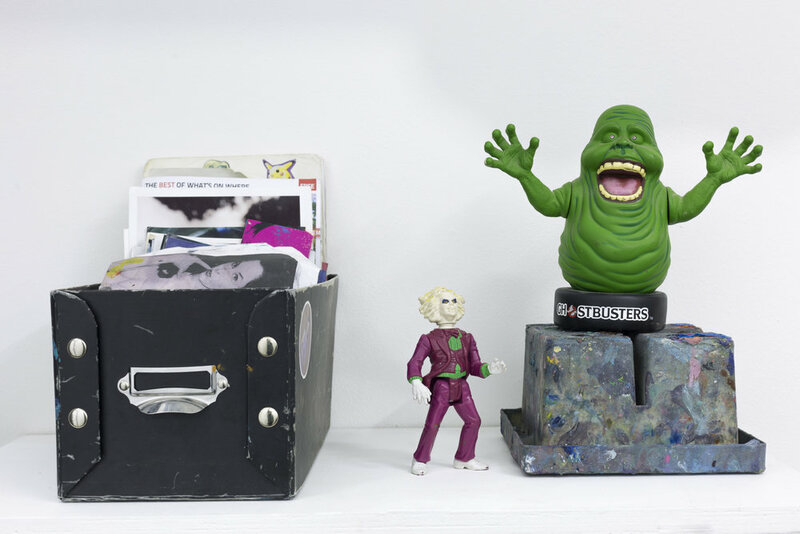 Darrell Hawkins: box of reference, characters and upside down brush pot. Georgie Hopton: Flower book, tray of coloured wool and still life of dried flowers. What do you look for in an artist when curating a show? Firstly I always use project concepts that interest me and motivate my own work, the artists seem to follow this, probably because I like their work and ways of thinking. I respond to complex methods and elements that surprise. Keep going, believe in what you produce and good things will come with time! Value the importance to develop relationships, but watch out for the idiots and time wasters who pretend to be someone they aren’t! Bella Easton: Blind emboss from paper cut, polystyrene wall, negative and positive paper stencils, fragment of old wallpaper, off cuts from painting, bits of dried paint on copper plate and paint marks left on paper. What are the details of the show? And is there anything else you would like to tell us about? Any other future projects? Collateral Drawing 5 is at Strange Cargo Arts, 43 Geraldine Road, Folkestone, CT19 4BD and runs for the whole of the period of the Folkestone Triennial, 3 September – 5 November. As previously mentioned, in conjunction to the exhibition held at Strange Cargo, Collateral Drawing will reveal for the first time its archive of over forty donated by-products from the artists that have shown in the Collateral Drawing project so far. The first at Margate Washhouse, Margate which has already taken place early this September and will be followed this October by another show at The Brewery Tap UCA Project Space in Folkestone, 5th-11th October. It is a busy month and I also have a solo show of my recent work, called BREATH at BEARSPACE London, from 22 September – 21 October. Header image: Rose Wylie's heap of paint covered newspaper, pots and brushes from studio.